Sesamol is a lignan isolated from sesame seed oil. In recent years, it was found that sesamol could decrease lung inflammation and lipopolysaccharide (LPS)-induced lung injury in rats. In this study, we investigated whether sesamol exhibited anti-inflammatory activity in LPS-stimulated macrophages. RAW 264.7 cells were treated with sesamol, then treated with LPS to induce inflammation. The levels of proinflammatory cytokines were analyzed with ELISA. The gene and protein expression of cyclooxygenase (COX)-2, inducible nitric oxide synthase (iNOS), and nuclear factor erythroid-2-related factor 2 (Nrf2) were evaluated with real-time PCR and Western blots, respectively. We also examined inflammatory signaling pathways, including nuclear transcription factor kappa-B (NF-κB) and mitogen-activated protein kinase (MAPK) pathways. Sesamol inhibited production of nitric oxide, prostaglandin E2 (PGE2), and proinflammatory cytokines. Sesamol markedly suppressed mRNA and protein expression of iNOS and COX-2. Sesamol enhanced the protective antioxidant pathway represented by Nrf2 and HO-1. Moreover, sesamol suppressed NF-κB transport into the nucleus and decreased MAPK activation, but it promoted adenosine monophosphate-activated protein kinase (AMPK) activation. 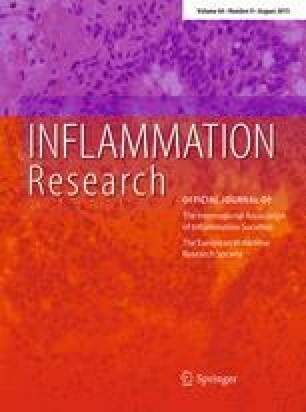 These data suggested that sesamol ameliorated inflammatory and oxidative damage by upregulating AMPK activation and Nrf2 signaling and blocking the NF-κB and MAPK signaling pathways. X.-L. Wu and C.-J. Liou have contributed equally for the paper. This study was supported in part by grants from the Chang Gung Memorial Hospital (CMRPF1C0021-2 and CMRPF1B0131-3) and the Chang Gung University of Science and Technology (EZRPF3D0071, EZRPF3D0081 and EZRPF3D0091).